Intel and Micron held a joint press conference earlier today to announce a breakthrough memory technology called 3D XPoint (pronounced 3D crosspoint) that’s up to 1,000 times faster (read speeds) than today’s NAND, features 1,000 times better endurance and is 10 times denser than conventional memory. 3D XPoint is described as whole new class of memory – not just a new type of NAND or DRAM – that operates fundamentally different than what’s available today. As the name suggests, it’s built on a three-dimensional architecture that uses a new type of switch instead of traditional transistors. 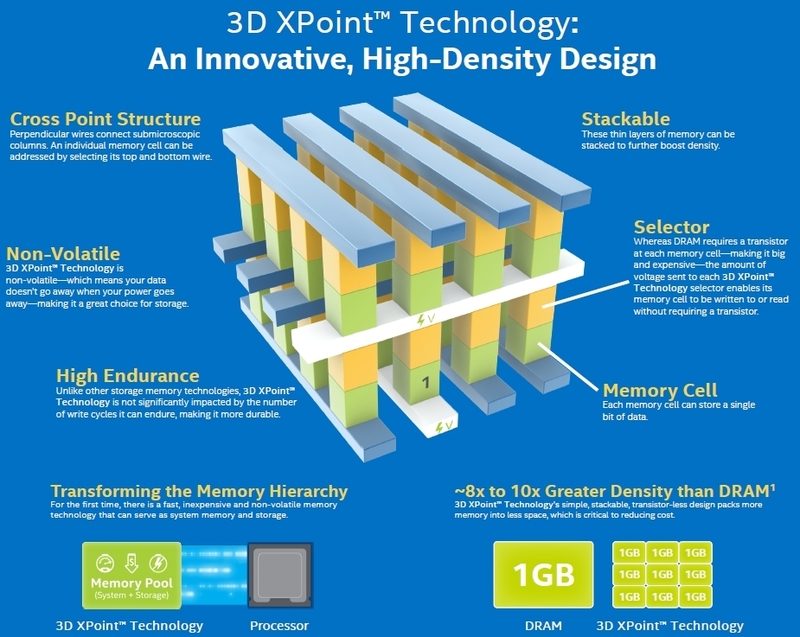 3D XPoint is also non-volatile meaning it can be used for storage purposes as well as function as traditional memory although the two companies repeatedly implied that it will could also lead to new types of computing experiences not yet conceived. The duo also pointed out that this is real technology, not just a PowerPoint presentation. To help drive home that idea, one of the first wafers from their joint production facility was shown off on stage. It certainly sounds impressive, but what does it mean for the average consumer? Probably not a whole lot right now. Intel and Micron said they will be sending out samples later this year before products using 3D XPoint arrive in 2016. If I had to guess, it’ll be huge companies with data-driven needs like Amazon, Facebook or Microsoft that will initially put the technology to use in the real world. As for consumer-based products, those will probably come further down the road. On the PC side, a new storage-minded interface capable of handling the kind of speed that 3D XPoint can deliver will be mandatory as today’s SATA III interface is already a bottleneck with existing SSDs. The technology could also find a home in mobile devices although if it’s more power-hungry than NAND, that could be a hindrance. It’s entirely possible that a new type of battery technology could neutralize that shortcoming but I wouldn't hold my breath on that happening anytime soon.